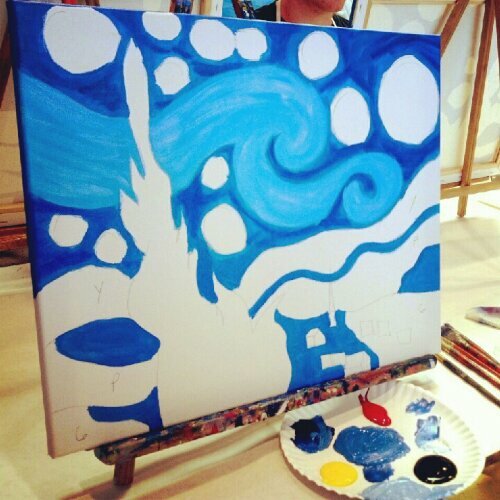 Friday night, I indulged in a fun evening of painting at Paint By the Glass. I’ve gone three other times, the last one being to paint a vibrant color rendition of Union Terminal in downtown Cincinnati. 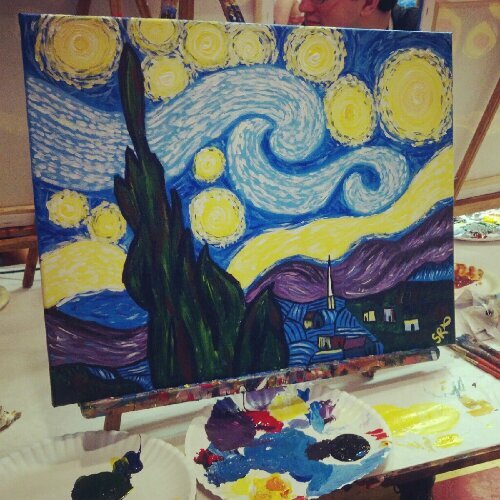 This time, my mom joined me to paint Van Gogh’s Starry Night. We have been so excited to do this one. In case you don’t know about Paint by the Glass, here’s the gist. 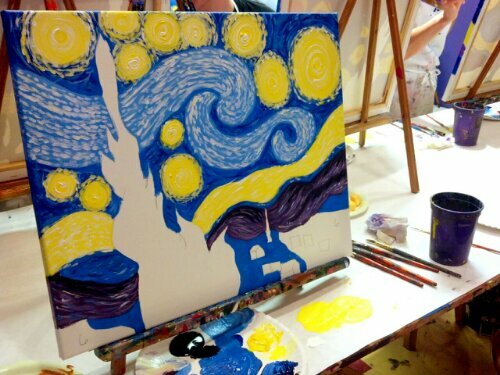 A “class” is held and people can sign up to come to a specific painting class. 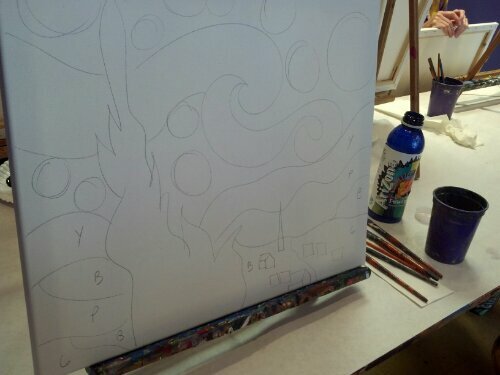 The painting is sketched out on the canvas and the artist instructs and demonstrates for those in the class. They serve wine and such as well as hors d’oeuvres. You can read about my first visit here. I’ve gone with friends and also by myself and enjoyed myself in both settings. I’m not usually intimidated by flying solo for an evening. Sampling of the paintings they do in the class. Some of these I hadn’t seen before; I would love to do the butterfly and flower one at the bottom! This is probably my new favorite thing! 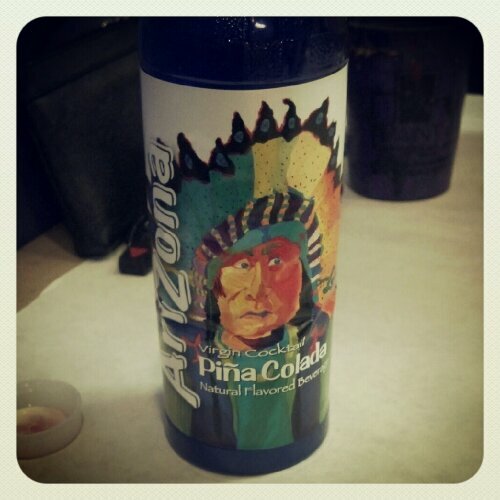 If only it didn’t come in a plastic bottle! They always start you off with a blank canvas and the picture sketched onto it. This is the first time I’ve ever seen them give any guide to the colors and such on the canvas, but it was very helpful since there was a lot going on with this painting. Blues are fun. This painting took a lot of blue. I mean, A LOT of blue. And yellow, but that comes later. You always start from the furthest thing back and come forward in the picture. We were supposed to do it all in flat colors, but I wanted to make mine with a little more texture before putting on the etch strokes. I like how it turned out. I wish I had paid closer attention to how big the yellow circles were and actually closed them in a bit with the blue, but it turned out alright having really large moon and stars. 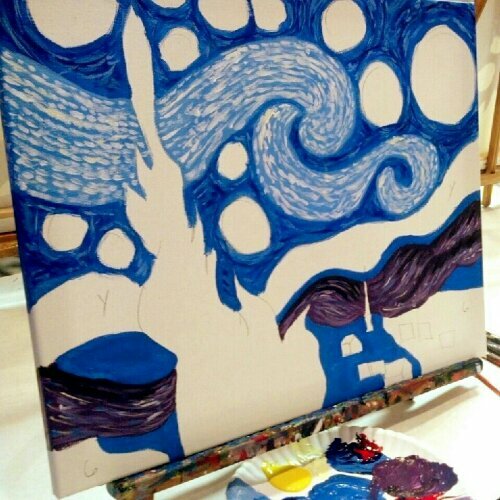 Making the swirls within the stars was probably my favorite part. My final product! ‘Twill look great in The House! I love how my tree and village turned out on the bottom. I had so much fun painting this! I think I do a lot better with more abstract painting. There aren’t as many rules, but I love coming to these classes and learning little tricks here and there to be a better painter. Kat and Ashley were the instructors that night and they were so helpful. We had such a large class that both were painting a canvas and walking around to help. Well, you already know that I’m a pretty big nerd, but I do get it honestly! My mom loves to watch the show Doctor Who and got me hooked on it as well. 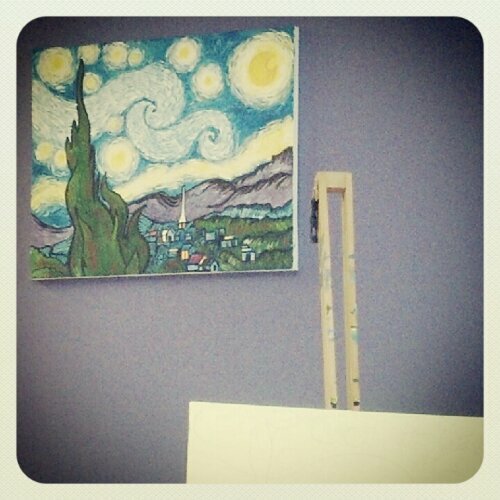 One episode, I think last season, had The Doctor and companion Amy go back to visit Vincent Van Gogh. Afterwards, when they were in a modern art gallery, they looked closely and found a Tardis (his space ship) tucked into the painting. Mom was really keen on duplicating that into her painting. 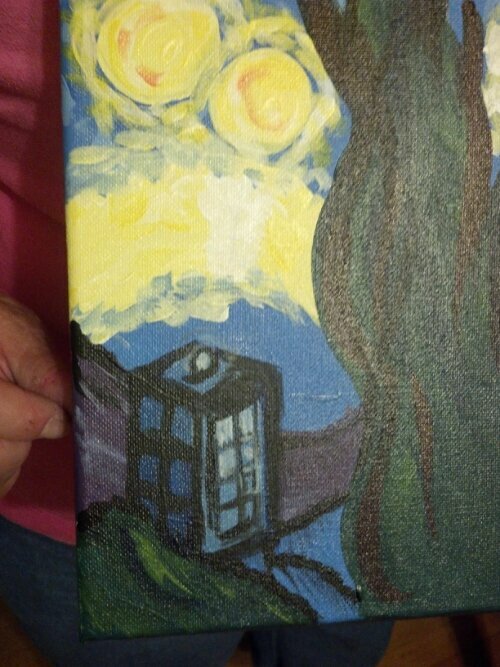 She got the basic shape down and then Kat (a fellow Whovian) helped fill in the details. Mom is so excited for her painting now. Check out my previous review of Paint by the Glass here! This entry was posted in Artsy and Craftiness, Promo and tagged art, Canvas, Cincinnati, Paint, Starry Night, Van Gogh, Vincent Van Gogh. Bookmark the permalink.